Conditions today are essentially the same as during the great depression. I talked about this in Humpty Dumpty On Inflation. When I wrote that piece, I listed 15 conditions one would expect to see in deflation and the score was a perfect 15-15. I recently added a 16th: bank failures. Click on link to see the conditions table. Those who stick to a monetary definition of inflation pointing at M2, M3, MZM, or base money supply, as well as definitions that involve prices are selecting a definition of inflation that makes absolutely no practical sense. It is the destruction of credit, coupled with the fact that what the Fed is printing is not even being lent that matters, not some Humpty-Dumptyish academic definition that has no real world application! I have long been arguing that we are in deflation based on the following definitions: Inflation is a net expansion of money and credit. Deflation is a net contraction of money and credit. In both definitions, credit needs to be marked to market. I can express the above mathematically. Some may point out that base money is not the only real money out there. Deposits are real. Actually most deposits are fiction, borrowed into existence via an accounting entry and lent out with the miracle of fractional reserve lending time and time again. Moreover, savings accounts have zero reserve requirements and the bulk of checking accounts which are supposed to be available on demand are swept nightly into savings accounts so that they too can be lent out. However, the FDIC guarantees those deposits up to the FDIC limit, now at $250,000 per account. Because of FDIC it might seem that deposits up to the guarantee limit should be accounted for in the above equation. One could do that by adjusting the right side of the equation to allow for FDIC guarantees. This would result in a peculiar formula of adding credit extended with 30-50 times leverage on inherently worthless paper to guarantees promised on that which does not really exit. From a practical standpoint however, the economy seems to be acting as if base money and FDIC guarantees are irrelevant and the only thing that matters is the market value of credit. Let's explore why that is using a magical printing press as an example. Assume for a moment you invent a magical printing press. Your machine can print hundred dollar bills so good that the US Treasury cannot distinguish them them from the real thing. The bills are perfect in every way. Now assume you print $5 trillion worth of those bills and bury them in your back yard. Is this inflation? Surely not. Would it be inflation if $5 trillion in bills were spent and entered the economy? You bet. The key then is not how much the Fed prints, the key is how much of that money makes its way into the economy. I agree whole heartedly with Shostak and suggest we are following the Japanese model. This has been my thesis for years. The Fed tries to hide the contraction in the market value of bank credit by its Don't Ask, Don't Sell policy. See Fed and BOE Shell Games to Bailout Insolvent Banks for more discussion of the aggregator bank shell game and the Don't Ask, Don't Sell policy. Many point out that base money is rising at an amazingly high rate. However, as we have seen, base money is irrelevant until the money is lent. The key issue is that the market value of credit is collapsing at an amazing rate. One can choose to say in strict Austrian terms there is no deflation because money supply is rising. However, the money supply theory falls flat on its impractical face when it comes to accurately explaining what is happening in the real world. The inflation model simply does not fit. Conditions one would expect to see during inflation, stagflation, hyperinflation, and disinflation are nowhere to be found. The US shows 16 symptoms of deflation for the simple reason deflation is at hand. Steve Saville chimes in on the The Inflation-Deflation Debate with a thesis that suggests there are lengthy and variable time delays between changes in the monetary trend and changes in prices. Let's take a look. For many years we have been expecting inflation (growth in the supply of money) and nothing but inflation as far as the eye can see, but there have been times, such as the past 12 months, when we have felt more affinity with deflation forecasters than with most other inflation forecasters. The reason is that monetary inflation, when measured correctly, was minimal during the first half of 2008 and during the two preceding years, thus setting the stage for a US$ rebound and large price declines in the investments that had been bid up to astronomical heights. We agree with much of the analysis presented by the well-known deflationists. The main point of contention revolves around the ability of the monetary authorities (the Fed and the Treasury in the US) to keep the total supply of money growing. Our view has been, and continues to be, that the Treasury-Fed tag team has the power to promulgate monetary inflation under almost any economic circumstances and will use this power. The bond market could eventually impose a practical limitation on the government's ability to inflate because increasing the money supply becomes counter-productive once the bond market begins to anticipate rapid currency depreciation, but if price-related evidence continues to favour the deflation view over the coming year then this limitation will not arise anytime soon. The case is not yet closed, but the evidence presented to date supports our view. For example, the monetary base has expanded at an astronomical pace over the past five months. 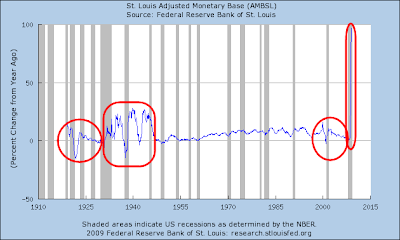 Mike Shedlock has attempted to counter this by pointing out that a sharp increase in the adjusted monetary base (AMB) also occurred during the early 1930s, but the St. Louis Fed's updated long-term chart of the AMB shows that the recent increase has been many times greater than anything during the 1930s. In any case, the overall monetary situation today could hardly be more different to the early 1930s. During the early 1930s the Fed increased the monetary base, but the total supply of money plunged. I agree wholeheartedly with Steve Saville that the Fed can print money at will. 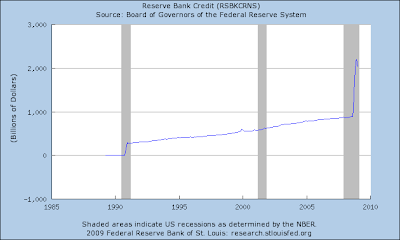 However, getting banks to lend is another thing indeed as the following chart of Reserve Bank Credit shows. Simply put, the Fed cannot force banks to lend or consumers and businesses to borrow. Congress can force the issue with TARP funds and other so-called "stimulus" measures. Then again, writeoffs of bad loans are going to increase at a massive rate, especially credit card defaults and foreclosures in conjunction with rising unemployment. What About The Lag Theory? Saville states "a lot of confusion on the inflation/deflation issue is caused by the lengthy and variable time delays between changes in the monetary trend and changes in prices." Another way of phrasing Saville's theory is that growth in credit (and prices) follows the creation of money, with a lag. This is the money multiplier model. Please consider commentary from Steve Keen’s Debtwatch, Roving Cavaliers of Credit. 1. The creation of credit money should happen after the creation of government money. 2. 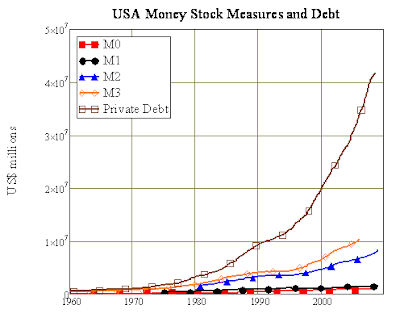 The amount of money in the economy should exceed the amount of debt, with the difference representing the government’s initial creation of money. Testing the first hypothesis takes some sophisticated data analysis, which was done by two leading neoclassical economists in 1990. If the hypothesis were true, changes in M0 should precede changes in M2. “There is no evidence that either the monetary base or M1 leads the cycle, although some economists still believe this monetary myth. Both the monetary base and M1 series are generally procyclical and, if anything, the monetary base lags the cycle slightly." Thus rather than credit money being created with a lag after government money, the data shows that credit money is created first, up to a year before there are changes in base money. This contradicts the money multiplier model of how credit and debt are created: rather than fiat money being needed to “seed” the credit creation process, credit is created first and then after that, base money changes. Solid evidence that credit is created first and reserves later can be found by reviewing Fannie Mae’s and Freddie Mac’s Financial Problems, an article written July 15, 2008. To make certain that the GSEs have adequate funds to cover potential losses, OFHEO (like all financial regulators) imposes capital requirements. At the end of 2007, the two GSEs had a $24.8 billion surplus over the regulatory capital requirement of $58.4 billion; they had a surplus of $50.8 billion over the risk-based capital requirement of $38.8 billion. These amounts can be compared with the combined retained mortgages portfolios of $1.434 trillion and the $3.501 trillion in MBS that the GSEs guaranteed for a total of $4.934 trillion. The regulatory capital surplus amounted to 0.50% of the $4.934 trillion and 1.03% of the risk-based capital surplus. If the GSEs were to face losses in excess of their income by these percentages, they would be forced to either reduce their capital requirements by selling mortgages and MBS from their portfolios or to raise new capital from investors. The Secretary of the Treasury is authorized to lend the GSEs $2.25 billion each, but this is more a symbolic amount than a total solution. Based on Fannie Mae’s issuance of $1.588 trillion in short term debt in 2007, the $2.25 billion would have lasted less than 12.5 hours. Based on the $598.6 billion issued of short term debt that Freddie Mac issued in 2007, the $2.25 billion would have lasted just under 33 hours. Fannie Mae's capital surplus was 0.50% on close to $5 trillion in assets. In other words, Fannie extended credit at will with virtually no reserves behind it. The Treasury provided reserves later, after Fannie and Freddie imploded. Steve Saville points out that recent increase in base money has been many times greater than anything during the 1930s. Steve is correct as the following chart shows. Note that the pattern leading up to the great depression and the pattern before the latest spike are nearly identical. There is no other similar pattern on the chart. And most certainly the recent spike as Saville points out is unprecedented. Base money is indeed soaring. However, so is debt. 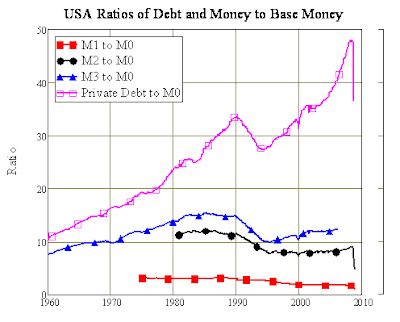 Here are some more charts and commentary courtesy of Steve Keen’s Debtwatch. I agree with Steve Keen in regards to money vs. credit, with credit being far more important, at the present time. Furthermore, rising unemployment is only going to exacerbate the problems of imploding credit. Expect to see massively rising credit card defaults, foreclosures, and walk-aways, all on account of unemployment that is soaring. Finally, it is important to consider the role of attitudes going forward. Attitudes affect the willingness of consumers to take on debt and banks to extend it. Boomers are heading into retirement. A significant portion of their retirement plan (home prices) has already been wiped out. Another portion of boomer retirement plans is being wiped out in the stock market crash. Toy accumulation is out. Fears of insufficient saving is in. Boomers will be traveling and spending less than they planned. A secular shift to frugality and risk aversion in all age groups has begun. Signs are everywhere. The lend to securitize model at banks is dead. So are toggle bonds where debt is paid back with more debt, and a myriad of other financial wizardry schemes. Children who have seen their parents wiped out in bankruptcy or foreclosed on are going to have a completely different attitude towards debt than their reckless parents did. Expect to see more frugality from parents and their children alike. In Zimbabwe, credit does not exist. You simply cannot walk into a bank and get a loan. Nor would anyone in their right mind deposit money in a Zimbabwe bank as part of a saving program. The money would be worthless in a month. In the US credit is not being extended for a different reason. Banks are not afraid of being paid back with cheaper dollar, banks are afraid they will not be paid back at all. Cash is being hoarded by banks and consumers alike. This is the opposite of what happened in the Weimar Republic and what is happening now in Zimbabwe. There is yet another kicker to this model. And that kicker is the Eurozone, the UK, Japan, and essentially every county on the planet is all attempting some sort of stimulus plan or other. This is bound to cause a major distortion at some point, as no country has anything remotely close to an exit strategy for this. What kind of distortion and when cannot be certain because we are indeed in uncharted territory, worldwide.